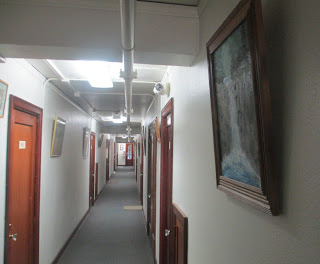 During the monthly Bellingham Art Walk, my friend Kevyn invited people on a tour of art in the halls at Mount Baker Apartments where he lives. A few of us met him at the door so he could let us in. Others lived in the building. Art from various sources displayed in the halls including some left in apartments after tenants moved out. See more images here including a view out over downtown Bellingham from the 8th floor.